A female Police Officer from the local Drug and Gang Task Force was recently shot while on duty. She is now confined to a wheelchair. When she came up to the microphone on Saturday at USC, and explained how her life was almost taken away from her, and how the “Swim With Mike” organization has, in essence, GIVEN HER BACK HER LIFE, the LAST thing you’re thinking about is UCLA vs. USC. Thanks to the Charitable, USC-based Foundation that resides at swimwithmike.org, this young Officer is going to be able to attend USC as a Communications student, and will get an entirely new lease on life. Rivalry? What Rivalry? (Maybe the USC Song Girls saw us sincerely tear up, and that’s why they were so cordial about all the intrusive photography that followed — or maybe they are just used to it. Either way, we appreciate it). If you like the photos that accompany this article, we urge you to make a donation to swimwithmike.org. They have been helping people for almost 30 years now, through these events, which include silent auctions. They raised over a million dollars today, which should pay for quite a few USC Tuitions. We would love for you to buy some “Neu Era” merchandise from OUR store (linked to the right), but today, we don’t mind if you disburse your money in a way that will bring you more satisfaction than buying a t-shirt probably will. And you can’t write the t-shirt off your taxes. We wonder what percentage of “readers” are actually even reading this (versus what percentage just immediately scrolled down to the photos), and from that, if even one single person will check out their website. Well, if only one person does, maybe it will be Henry Samueli (Bruin benefactor and Owner of the Anaheim Ducks), and he’ll match what was raised today. SO… We have some rules: We don’t want any negative comments about the USC Song Girls. We don’t even want you COMPARING them to UCLA. We don’t want them angry about us sharing the photos, and if they are getting creamed by nasty feedback, then they SHOULD get angry. Accordingly, we have selected what we think are the most flattering shots, out of the 600 or so that were available. We picked the pics that we thought you would think are hot, so please enjoy them. However, don’t start thinking that they are superior to the Bruin Girls, because we also have photos that were NOT very flattering, that we would be forced to share, just to keep the record straight. But we have NO DESIRE to do that, so just DON’T COMPARE, please. And, if any of the Girls pictured are offended by the photos, we hope that they please remember that this is all for CHARITY. We don’t sell the photos, nor do we charge any fees, and we don’t even have any ads, pop-up or otherwise! If that is not good enough, the interested party should write to us and specify the problem, and we will try to oblige. And by the way, all the “Hate” on this site is intentionally over-the-top for humor, so please don’t let that cloud your judgement about how good these photos look, and how they might even encourage some viewers to donate to Mike. Where are the UCLA Girls, you ask? What happened to “coming together?” What we MEANT, was that the event was open to the Public, that there were some Bruins in attendance, that some other Bruins helped in the Prep, and finally, that the LIFEGUARDS on duty were Courtesy of UCLA. Unfortunately (and that is a deluxe understatement), the Bruin Spirit Squad is not a part of this event. IF ONLY the Bruins had a Charity that required taking a swim! They probably DO, but Mollie is keeping it from me! Oh well — In the meantime, you’ll have to get by with the USC Song Girls – Great Sports all – in the following 23 photos. And assuming that we don’t get too many death threats and bomb scares after this first batch is published, there will be more — many more — coming soon. Remember — BE NICE — We know that you are going to be dying to say stuff like “Well, they don’t have a Brianna or a Katie.” Don’t bother. Insults in any form about the subjects of these photos will not be tolerated, and that includes saying that they can’t hold a candle to their Bruin counterparts. After what they GAVE of themselves yesterday, they don’t deserve anything even remotely bad. And by the way, all these photos have “mouse-over captions,” that are 99.9% nice, and the photos all ENLARGE when you click on them, most to 1200 pixels across, which is great to right-click onto your Desktop, to be your new Desktop Wallpaper. And please don’t forget about the Swim with Mike “Cause,” that makes it all possible. "RIVAL WITH A CAUSE: USC SONG GIRLS TAKE THE SC PLUNGE FOR CHARITY" was published on April 13th, 2008 and is listed in News from the Dark Side, Non-Rivalry Photos, T-H Club Classic Posts, UCLA/usc/Cheerleader Photos, UCLA/usc/Sports Photos. t-h, i will respect your wishes…so no disparaging comments from me…hehe…but i’m glad these girls are helping out a good cause. Glad to see that a fellow Birmingham “Brave” has an eye for worthwhile charity events; cause, scenery and that’s about it….Your site is kind of like an SI swimsuit issue light….something to keep the blood circulating during the off-season…. great cause – Swim with mike! Very nice, that Brunnette pictured with the Blonde on the picture below carroll is not too bad at all!! 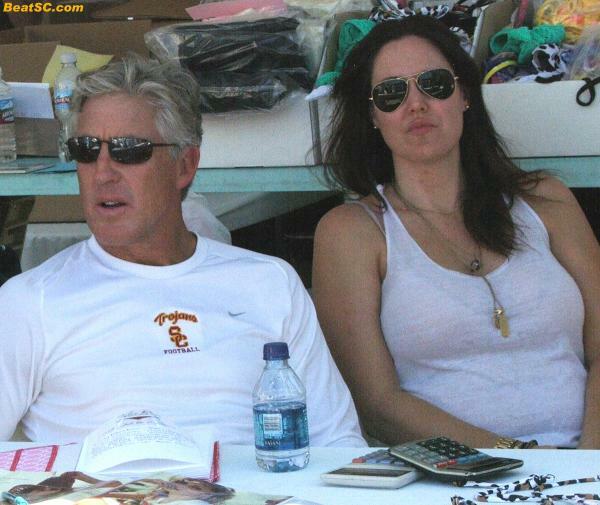 You were doing so good, showing this group fine looking girls, but you had to RUIN IT by including pete carroll. Oh well, I guess there is a price to pay for everything – by looking at his mug. The photo I’m looking for is of the girl in the full song girl outfit *after* she gets out of the pool. That had to be awesome. Ha check out the link from SI on Campus. These girls are being torn apart! BUT they aren’t up to standards for the hype they get. Check out the links some obsessive dudes posted of SI’s Cheerleader of the Week (FSU Cheerleader – Alyssa Sponaugle). I hate the Noles, but they got a point, AMAZINGLY BEAUTIFUL & cool as sh*t! Real chick, definitely not the norm for a cheerleader. Her in a swimsuit is worth seeing! Trust me!!! Southern girls are so much better looking. I looked at the photos of Alyssa Sponaugle of FSU and she is pretty, but there is absolutely no comparison between her and any of the Bruin girls such as Katie, Brianna, Elise, Michelle and Kristen . . . none! the Bruin girls are clearly HEAD AND SHOULDERS above Alyssa. Sorry Robert – going to have to agree with Robby & Joe Mammy about Alyssa and the southern girls! You obviously have a slight obsession with bruin chicks but if you look up fsu, uga, bama, miami, uf you will definitely be proved wrong. A REAL BEAUTY!!! Her swimsuit pics surfing far surpass anyones I’ve yet to see!!!!!!! You will soon change your mind Robert!